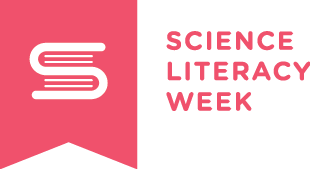 September 19-25 is Science Literacy Week and we are celebrating it at the Leddy Library. 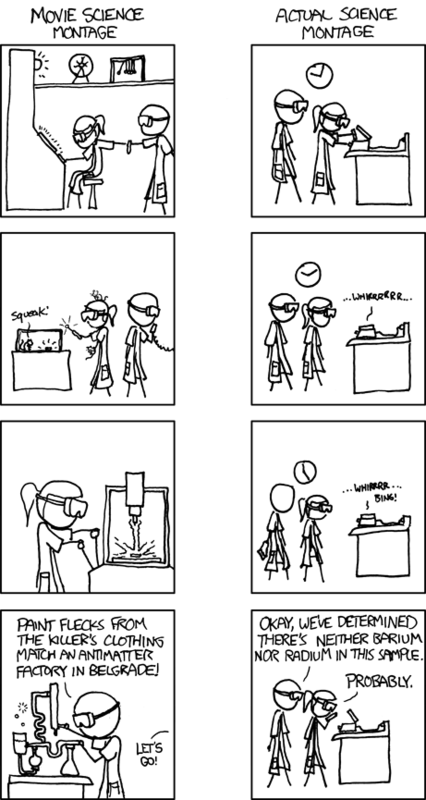 As we explained yesterday, one noble reason to become science literate is to understand the jokes of the web comic, XKCD by Randall Munroe. Randall describes himself as, "I'm just this guy, you know? I'm a CNU graduate with a degree in physics. Before starting xkcd, I worked on robots at NASA's Langley Research Center in Virginia. As of June 2007 I live in Massachusetts. In my spare time I climb things, open strange doors, and go to goth clubs dressed as a frat guy so I can stand around and look terribly uncomfortable. At frat parties I do the same thing, but the other way around." Munroe is also the author of What if? : serious scientific answers to absurd hypothetical questions and Thing explainer : complicated stuff in simple words , both of which can be found on the shelves of the Leddy Library. 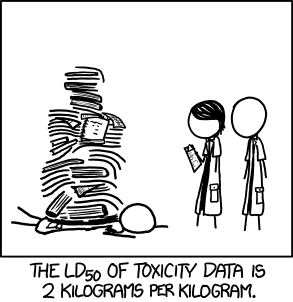 Every day this week, I'm going to offer some XKCD comics dedicated to Physics, Earth Science, Mathematics, Computer Science and - today - Biology, Biochemistry and Chemistry! 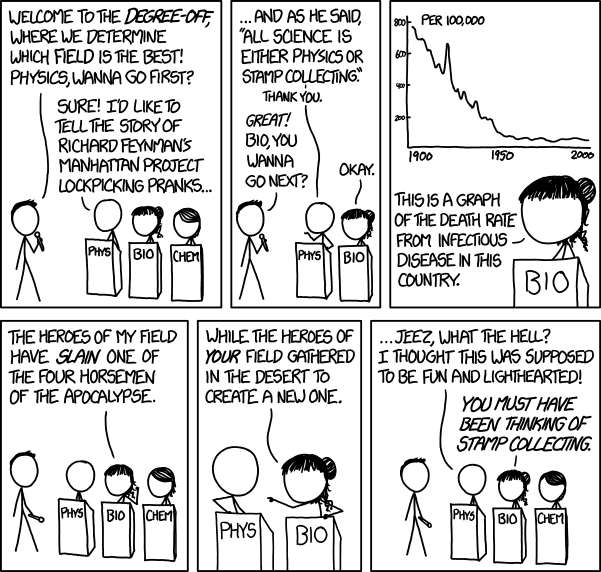 Don't worry if you don't get the jokes - each cartoon is linked to it's respective XKCD Explain entry! Alt-text : The rat's perturbed; it must sense nanobots! Code grey! We have a Helvetica scenario! Alt-text: Conspiracy theory: There's no such thing as corn. Those fields you see are just the stalks of a fungus that's controlling our brains to make us want to spread it. Alt-text: Researchers just found the gene responsible for mistakenly thinking we've found the gene for specific things. It's the region between the start and the end of every chromosome, plus a few segments in our mitochondria. Alt-text: I'm rubber. You're rubber. We contemplate the reality of our existence in mute, vulcanized horror. Alt-text: The dose is much lower when administered orally. We're still trying to get the paper into the needles for subcutaneous injection. 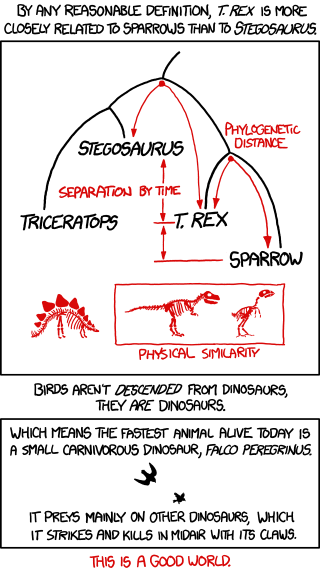 Alt-text: Sure, T. rex is closer in height to Stegosaurus than a sparrow. But that doesn't tell you much; 'Dinosaur Comics' author Ryan North is closer in height to certain dinosaurs than to the average human. Alt-text: PHARAOH IRY-HOR, FROM THE 3100s BC, IS THE FIRST HUMAN WHOSE NAME WE KNOW. Alt-text: In sixty million years aliens will know humans only by a fuzzy clip of a woman in an Axe commercial. Alt-text: I'M SORRY, FROM YOUR YEARS OF CONDESCENDING TOWARD THE 'SQUISHY SCIENCES', I ASSUMED YOU'D BE A LITTLE HARDER.